Lucky me that I have a cousin with two growing boys who loves to cook and feed her kids healthy foods. She makes a version of this recipe in a pie dish and has been trying to convince me that her boys absolutely devour it whenever she makes it for them. Although I sometimes find statements like that hard to believe when we're talking about green foods and highly independent little boys, I’m always game for recipes that defy the odds. I decided to take my cousin’s original recipe, make a few tweaks to the ingredients and then cook them in mini muffin cups instead of a pie dish, because it cooks faster (and after all, what kid doesn't like something mini?). As for my my initial doubts about the kid appeal of this recipe, after watching Kenya repeatedly walk by the cooling rack to grab three of them within 15 minutes and Chloe scarfing down four at dinner, I realized these could be one of the all time greatest kid and parent friendly recipes I've ever made. Delicious, healthy and SO easy to make. My cousin gets total props for this kiddy culinary hit! 2. Melt the butter in a sauté pan over medium heat and cook the onions for 4 minutes until tender. 3. Add the garlic and cook an additional minute then set aside to cool. 4. Whisk eggs in a bowl and stir in ricotta, mozzarella and parmesan cheeses. 5. Once combined, stir in spinach, salt and cooled onion and garlic mixture. 6. Pour the mixture into lightly greased mini muffin cups. 7. Bake for 20-25 minutes or until the filling is set and golden on top. How long will these keep in the refrigerator? I'm making them tomorrow and am wondering how many days of daycare snacks I'll have before they get yucky. My husband loved them and my 3 year old ate it but only because he had to, 11 month old poo poo'd it. Lifesaver with my 11 month old, who is going through a picky phase! This recipe (without the onion and a little less parm) got the \"happy hands\" wave of approval. She could feed them to herself or eat off of a fork---having these options also made her happy. Thank you! LOVE LOVE LOVE this recipe! The kids love it and I love it for a nice quick lunch - especially the leftovers! Well, I had high hopes after reading all the comments, but unfortunately my 19 month old son was not impressed. He loves mini muffins, but he won't have anything to do with these, even though he likes ricotta and eats other things seasoned with onion and garlic. The good news is that my husband and I find them delicious and are quickly eating up the whole batch! I'll try again with my son in a few more months and with any luck he'll be more receptive then. These are fantastic!!! I used a little broccoli as well as spinach and they turned out great. Would adding chopped turkey bacon to make these more of a breakfast treat work or would it change the finished product too much? I'm looking for a breakfast-y version of an egg-based \"muffin.\"
for an egg allergy, what could we sub for eggs? flax? hmm for this recipe, sound a little tricky. The egg is the main binder so not sure how it would hold if you used the flax/water sub. Do you have any other egg substitute in mind? Do you think cottage cheese could be substituted for the ricotta, we have a ricotta allergy? I haven't tested it with cottage cheese, but I don't see why it wouldn't work. Let me know how they turn out! How would you reheat after being in the freezer? I have some fresh spinach I need to use up - any idea how much to use in place of the frozen? Can you freeze and reheat these? I make these in double batches, freeze and reheat a few at a time. To defrost I usually just put them in the oven for a few minutes while I'm reheating it for another purpose. And Frank, you should try them again - these turn out fine for me, and even my very picky 15 month old twins will eat them! If you only have regular sized muffin tins, what would the cook temp and time be? 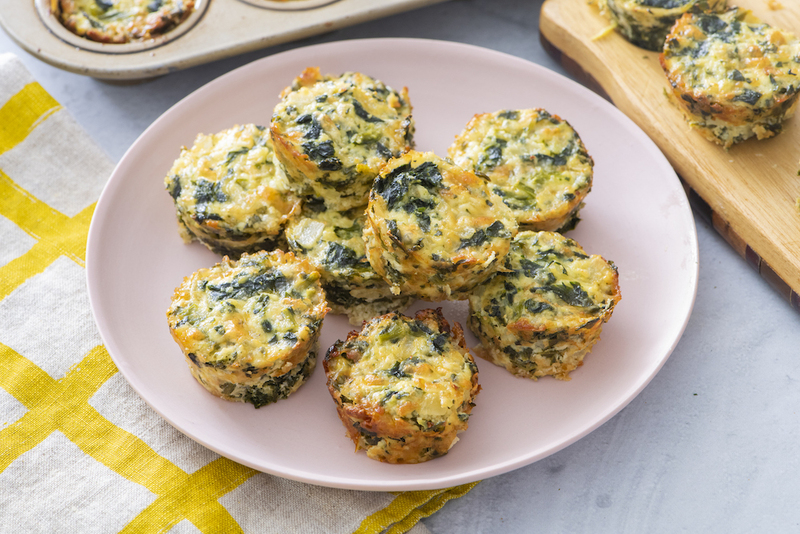 Sorry, but this is a horrible recipe, and certainly a far cry from anything healthy!To begin with, the recipe does not \"gel\" in the mini-muffin tins, even after cooking an extra 1/2 hour!Anyone who actually followed this recipe, would know this. This recipe has to go back to the drawing board for some more thought even though I think it may have potential, but perhaps with a little flour? Gosh, so not true for me and many other who have definitely tried the recipe! I followed the recipe to the letter as I do with all Weelicious recipes (I depend on them being accurate) and the batch came out perfectly. I made a batch again tonight, this time using zucchini instead of spinach and they came out perfectly, like little quiches. I've made these at least a half dozen times over the last 6 months and never had an issue - give them another try Frank, they are WORTH it! These came out perfect for me with one try. A friend of mine who doesn't even cook wanted to try out this recipe and she was successful as well. Did you try to cook them in a regular sized muffin tin perhaps? That would require a longer cooking time. I didn't even measure the Ricotta, Mozzarella or Parmesan Cheeses &amp; this recipe worked great! Also, I only used half a box of frozen spinach (as we don't work in oz here in Australia) &amp; all turned out great. I've made these several times and they've always turned out really well. I wonder what you are doing differently. Sorry you had a bad result but I agree Jaime. wow! another fantastic recipe. I wonder if anybody has tried to change it up with a little artichoke, red pepper flakes or possibly mushroom? I made these this morning and what a huge success! My in-laws are visiting and they ate them all up. So easy to make. Great recipe. Thank you! Made a double batch for a party. Used olive oil instead of butter and added some black pepper and basil. Had to keep my family (and myself) from eating everything before the party. They were much appreciated by some low-carbers and a gluten-intolerant guest. Recipe was easy enough to rattle off to anyone (everyone) who asked. These were so yummy using my fresh goat-milk ricotta! Next time, I'll try other readers suggestions and add mushrooms to the mix! Very tasty. The whole family loves them. This was my son's (15months) first introduction to spinach. He loves them! I live in B'klyn ny. This is an old Kosher Syrian dish. We make it with ricotta or low fat cottage cheese with some Munster cheese. Yes the kids really love it. Usually served with a dish call Mujedrah. You can find these recipes in the cookbook \"Aromas of Aleppo. Love this recipe and for fun I substituted finely chopped steamed broccoli for the spinach and a cheddar/gruyere blend for the mozzarella. They turned out great and I just wanted to share. Such a fun way to get the kiddos to eat their veggies! These were delicious. I omitted the garlic and used fresh spinach. I just cut my fresh spinach up and stirred it in the batter. Overall, a little salty ......next time I will only use a pinch of salt. Just saw this recipe in Parenting magazine, complete with the same picture. Can't wait to try! Could I make this in a regular pie pan? If so, would everything remain the same and how long would I cook it for? Thanks so much. Hmm I haven't tested this in a full size pan, but I'm not sure it would cook all the way through... If you try it let me know how it comes out! I made these tonight for my 10.5 month old but used broccoli and cheddar instead of spinach and mozzarella because that is what I had on hand. I cut them in cubes and packed some up for his lunch tomorrow. Of course I had to try a couple and they were great. Hoping the rest freezes well! They do not rise. Fill the muffin cups all the way up! PERFECT!! They came up AMAZING! My daughter's in a serious teething phase with 8 teeth coming out so she wasn't eating ANYTHING. Today's the first day she's eaten anything serious! And she ate 2 of the minis!!! :D :D :D I used baby spinach, shredded parmesan instead of grated cuz that was all I had... and topped the mixture with parmesan &amp; mozzarella too! THANKS CATHERINE! I just made these again! :D And added a couple of things! I doubled the recipe, added in 3/4 package of ground pork (my husband's a carnivore!) into the saute pan with the onion and garlic, added a splash of white wine into the mix and followed the rest of the recipe with fresh spinach washed and pat dry with kitchen towels. And it turned out weelicious as usual! I made these last night and while my kids weren't so sure about them, my husband was popping them in his mouth like they were candy! I can definitely see trying this again but also seeing how they do with spinach and cheddar cheese. Thanks for the recipe! If I use fresh, raw spinach that I chop in food processor, this would work great, right? What is the best way to reheat these? If they go in the microwave do they come out rubbery? Can I use just egg yolks? So I don't have any spinach on hand, nor broccoli...would frozen peas and carrots suffice?? This was a success with a teething toddler! Thank you! Haven't made this yet, but wanted to let you all know that a potato ricer makes a great tool for squeezing water out of your spinach. Since we started eating low carb 15 years ago, we don't use our ricer for potatoes anymore, however we've found that it does an amazing job with thawed frozen spinach and canned tuna. I just wanted to say that my 4 year old and 19 month old are big fans of Spinach Bites. I realized yesterday that while they napped, I made the raspberry sauce, spinach bites and the banana wheat germ muffins -all from your cookbook! We are big fans! These stuck to my non-stick pan. Tried with liners and those were even worse. Any suggestions to make these not stick? I'm using mini muffin tin. While my 5 year old has decided he does not want to eat these, I make them for the adults! I always spray muffin tin with cooking spray! Tried these after watching your Facebook live, and my daughter loved them. She kept asking me for more. First, these are DELICIOUS! And a great time saver in the morning! Question for Nutrionals..what is the serving size please! It makes 20, but the nutrionals don't indicate how many per serving. Thank you! Can’t wait to try these! Can you use fresh baby spinach instead of frozen? Thx!!! i believe testimonies are real life proofs of miracle signs and wonders because of my personal experiences from other Spell-casters I contact so many other Love spell-casters before but none was able to help me bring back my ex love partner, until few days ago i gave Dr.Oduduwa spellcaster a final try, i love my husband man we had two kids together and i needed bring him back home, to be with me, there to care, love our children growing-up together as one happy family. I send message to Dr.Oduduwa contact address, immediately few minutes time, I receive reply message from him, i was so happy because the mail was valid and still working, I explain to my relationship problems to Oduduwa, I ask for his help to bring back my love Anderson back into love me more than ever before. I have good intention sharing, I believe this information will motivate and save marriage relationship from divorcing, break-ups and separation. because when two people truly love and care for each other, they will always look for ways to make it work, no matter how hard it's cost for love is stronger.